Equine programs for autistic children use therapeutic horses to improve sensory processing, communication, and social interaction. Many children seem to be drawn to horses across the board, and a child with autism is no exception. Incorporating equestrian activities into a treatment plan can benefit many individuals on the autism spectrum. Equine programs often involve therapeutic interventions known as hippotherapy with professional guidance. Many people in the autism community embrace the idea of using therapeutic animals to help promote appropriate behavioral responses to everyday situations. Horses can help in a number of ways. One of the most challenging aspects of autism and related pervasive developmental disorders is inappropriate behavioral responses. The behaviors can stem from a number of different sources and in some situations, they can be very stressful and overwhelming for everyone involved. Equine assisted therapy along with other autism treatments can yield excellent results in the behavioral realm. Sensory overload can lead to tantrums in many cases of autism and related pervasive developmental disorders. In some cases, the individual takes in too much sensory information and in others, too little. Equine assisted therapy for autism can help children to focus on the movement of the horse, allowing them to process sensory input more effectively. Sensory integration therapy for autism can help children learn how to regulate sensory input and horse assisted therapies provide many opportunities for integrating the senses. Developing good motor control is a fundamental element of developing necessary life skills. Horse therapy for autistic children allows the participants to use their muscles to control the movement of the horse. Some include grooming activities that improve fine motor skills as well. The motivating nature of the activities makes them ideal for encouraging communication. The inability to communicate effectively can be extremely frustrating for people on the autism spectrum. Although people diagnosed with Asperger's syndrome may not exhibit problems with language, some significant difficulties with communication are apparent when you look at details about Aspergers closely. Equestrian programs for autistic children promote communication. The child is highly motivated to use language and signs to ask to ride, continue riding, and to interact with the animals. 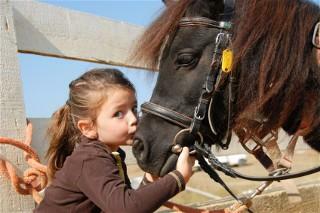 The nonverbal interaction between the child and the horse is a building block. The child learns how to control the movements of the horse and the animal provides feedback through its behavior. Equine therapy for autism can promote communication and this can lead to improvement in social skills as well. Children on the autism spectrum are able to practice interaction on a fundamental level, beginning with action and response, eye contact, and eventually transferring skills to human interaction. Children also have the opportunity to create relationships with counselors and other children involved in the programs. A child is very motivated to work with people when the activity is rewarding. Engaging in social interactions during the sessions is a wonderful approach. Each program is different and some think that it is best to allow the horse to pick the child. Programs that take this approach begin by having a staff member introduce the children while watching the horses' respective responses. In many cases, the horse indicates which child it prefers. Other programs simply assign a child to a horse using similar methods. The ideal situation pairs a horse and child that seem to have a connection or common bond. Horse Wisdom that offers Equine Growth and Learning programs for children on the autism spectrum as well as other populations. The mission of the organization is to help use experimental learning to help children improve social, emotional, and life skills. Aspen Ranch offers equine therapy for troubled teens and children. The organization recognizes the importance of using hippotherapy for developing self-regulation. Camp Huntington offers horseback riding in its therapeutic summer camp program. Cedars Academy includes equine therapy in its very structured environment. Parents do not have to send their children to summer camp or an overnight program in order to become involved with horse therapies. Local organizations that do not require temporary residential accommodations are readily available. You may find wonderful resources through your local agencies and through your child's treatment team, school or other autism program in your area.